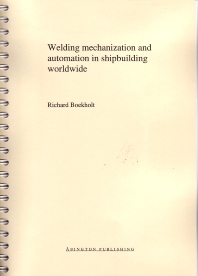 Introduction to the project; Building methods, ship structures and welding methods; Welding systems and processes used in the fabrication, assembling and building dock; The uses of semi-automatic and automatic GMAW and (FCAW) in shipbuilding; The influence of shop primers on weld quality for mechanized or automated welding; The introduction and use of welding robots; Use of plate and profile cutting systems; Future objectives, trends and developments in welding engineering and technology; Estimated productivity improvement by welding mechanization and automation; Environmental problems, the ageing of the workforce and efforts to attract young people to the industry through mechanization and automation. This report contains information from more than sixty shipyards from around the world, and gives a unique inventory of the different aspects of welding mechanization and automation used in building large, middle and small-sized ships. Shipbuilders, marine engineers and trade organisations will welcome and value this unique collection of data, assembled for the first time in such a comprehensive format, and interpreted by the author into trends for the future operation of the industry.